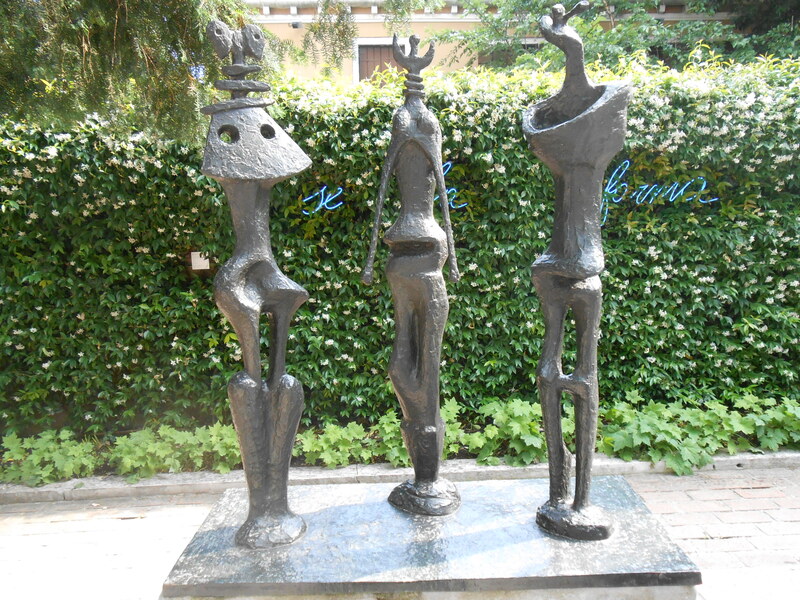 The Peggy Guggenheim Collection was high on my list of things to see in Venice. We arrived in this spectacular city mid-morning, checked into our hotel, and then wandered slowly but deliberately from San Marco Piazza, meandering along the calle in the general direction of the Accademia Bridge, and taking our time to view the exquisite sights on our way. I must have looked pretty silly with that grin of happiness filling my whole face as we explored the city, checking out every nook and cranny of the calle and campi we crossed. So much to see, and of course, not enough time. 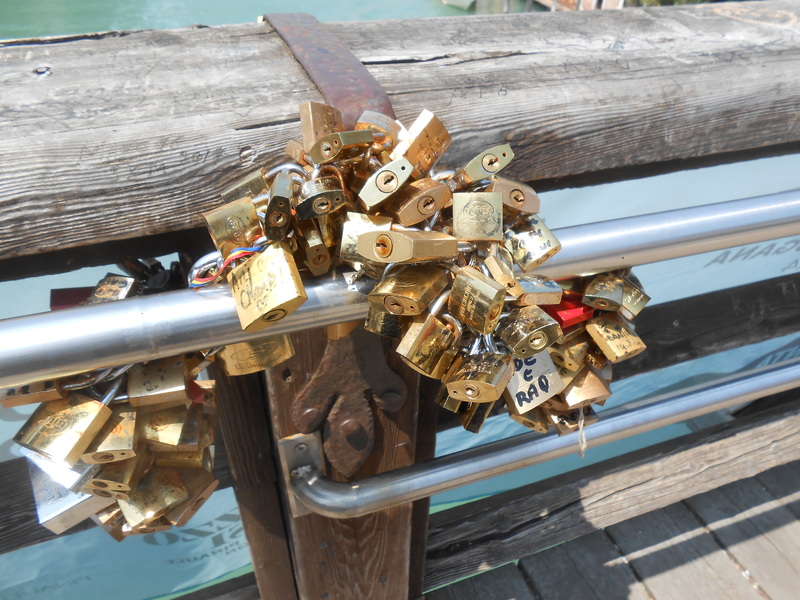 Hundreds of couples proclaim their undying and everlasting love for each other by signing their names on padlocks which they lock on the railings of the bridge. 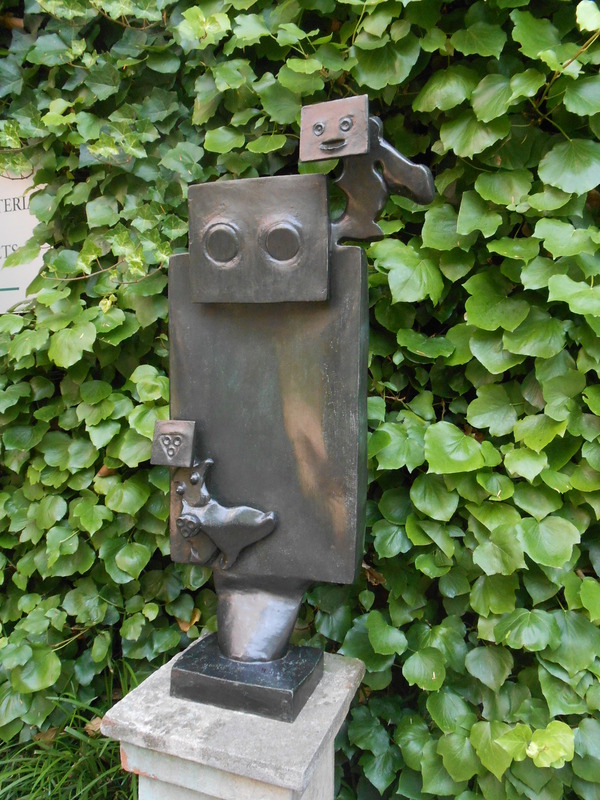 Peggy Guggenheim (1898-1979), niece and heiress of mining magnate Solomon R. Guggenheim, collected modern art in Europe and America at the beginning of and through WWII. Her home, the Palazzo Venier dei Leoni, built in the 1750s on the Grand Canal, was never finished by its original owner who had intended it to be a grand four-story masterpiece. Venetians have nicknamed this structure Il Palazzo Nonfinito (the unfinished palace). Guggenheim purchased the one-story building in 1949 and used it as her home as well as a museum for her extensive modern art collection. Guggenheim encouraged and supported many young modern artists (Henry Moore, Pablo Picasso, Marcel Duchamp, Vasily Kandinsky, Jackson Pollock, Andy Warhol, just to name a few) by collecting and displaying their artwork. 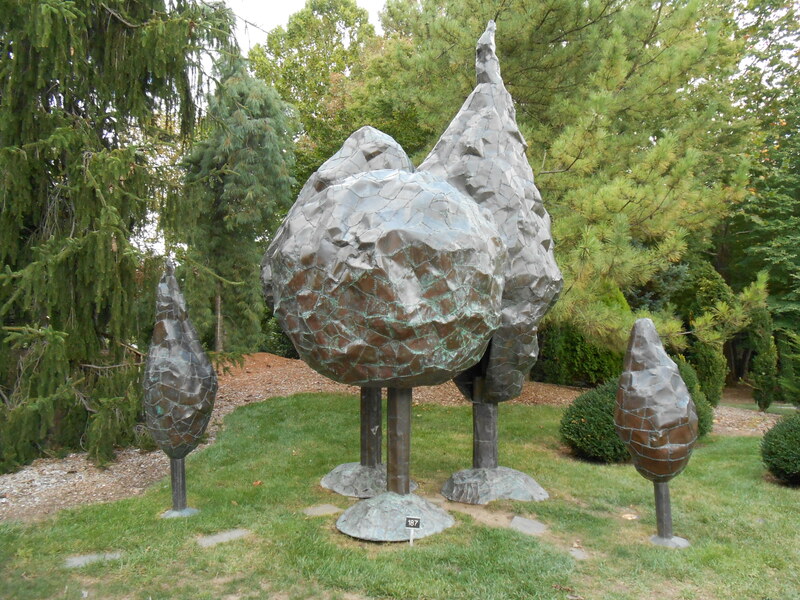 She married Max Ernst, also a contemporary artist whose artwork can be seen in the gallery and courtyard at the Guggenheim. 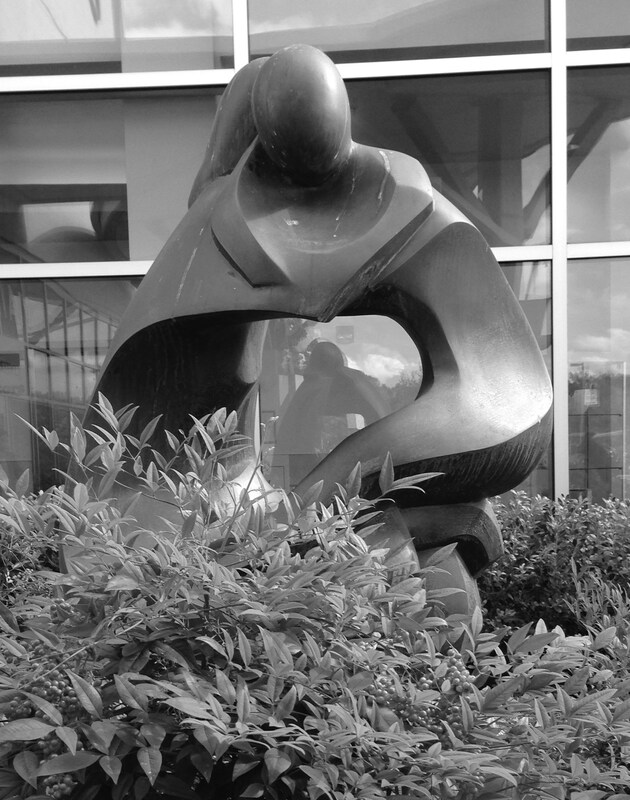 A man sits and contemplates a piece of sculpture in the Nasher Sculpture Garden (added in 1995) in the center courtyard at the Guggenheim Collection. 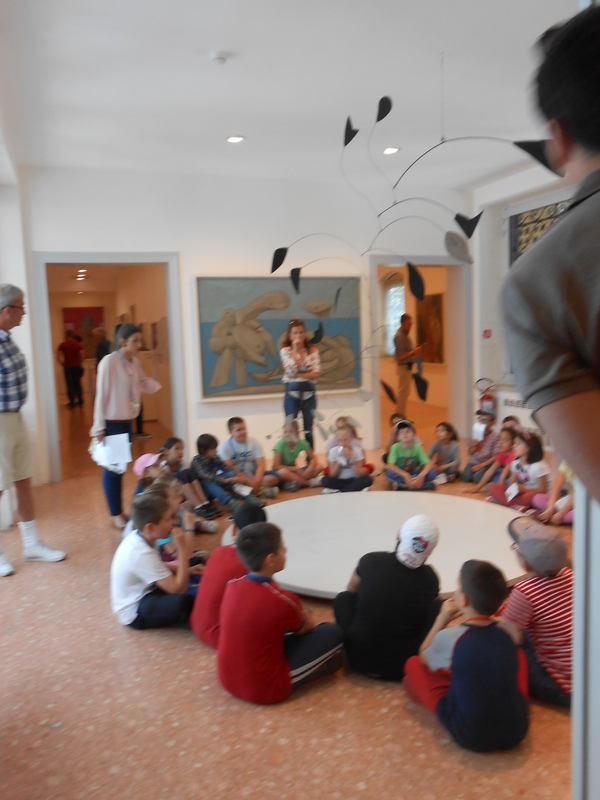 A school group visits the museum and hears about Alexander Calder’s life and art while sitting under one of his mobiles. 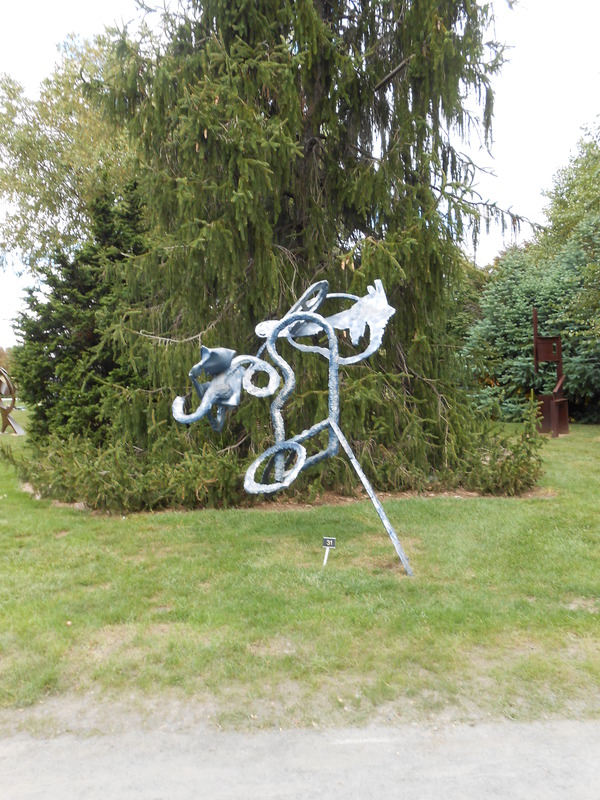 Our visit to the Guggenheim Collection was everything I expected it to be and more. To be in the galleries viewing the artwork of such well-known artists of the Cubism, Surrealism, and Abstract Expressionism movements was thrilling, and I definitely want to visit again. 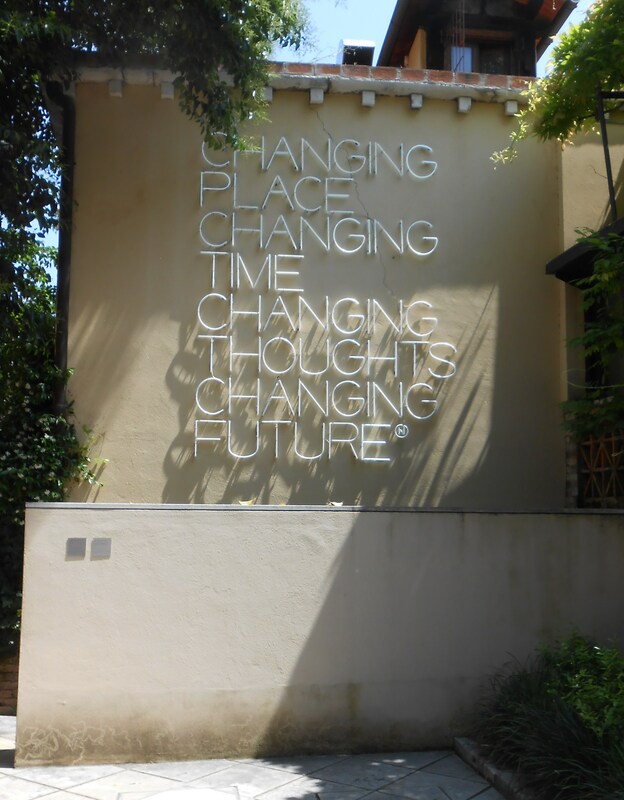 Go and enjoy Peggy Guggenheim’s Collection. Your college arts and humanities professor will be proud of you. 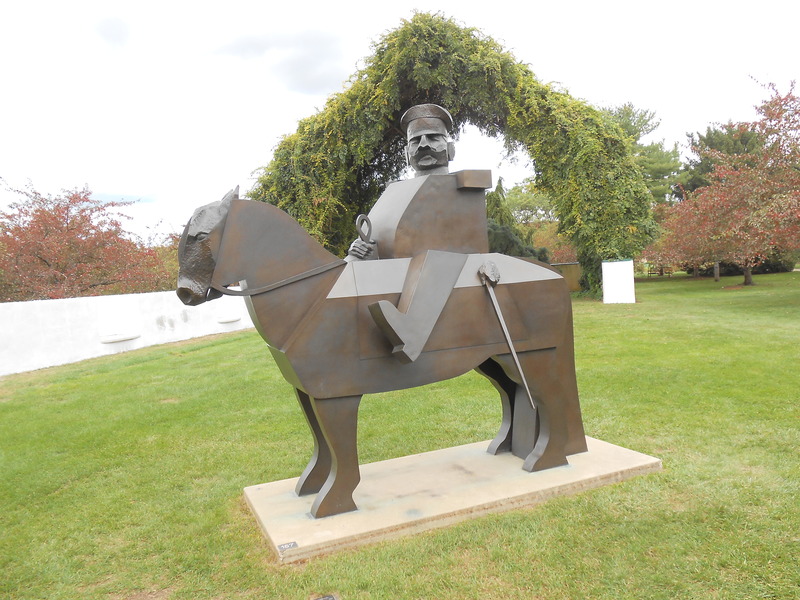 Click here for a delightful video peek at the Guggenheim Collection. 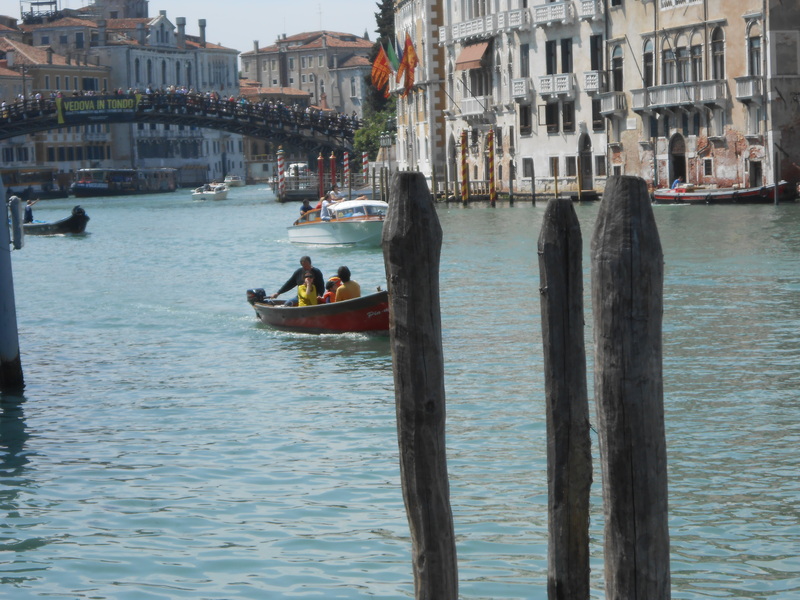 For my other posts on Venice, click on the titles below. We arrived in Venice on a sunny morning, but early afternoon dark clouds gathered overhead threatening to spoil our day. By late afternoon, rain sprinkled for an hour or so, but that didn’t stop us from wandering around and checking out the sights. Heading to Piazza San Marco on the Alilaguna line from Marco Polo Airport. 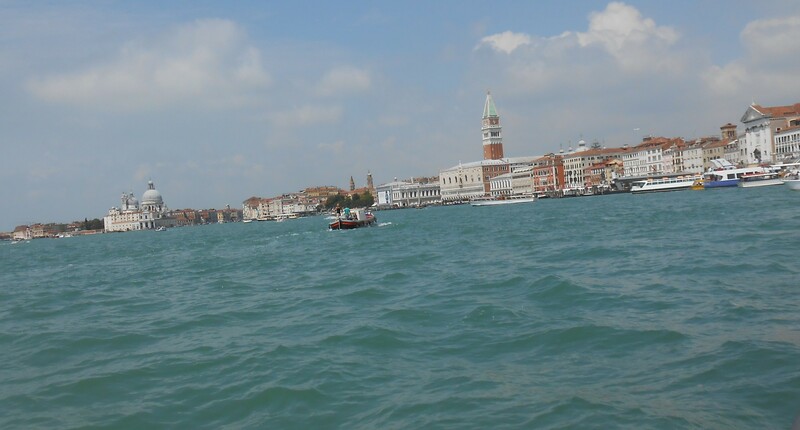 The water bus ride from the airport takes about an hour and provides a grand entrance to Venice. Venice is an intriguing city with unique and fascinating characteristics: its location and geophysical formation; its incomparable system of canals, calle (car-less streets), and quaint campi (squares); its history of economic, political, religious, and cultural influences; and its architecture, art, and literature. All of these bring forth a sense of wonder in visitors. 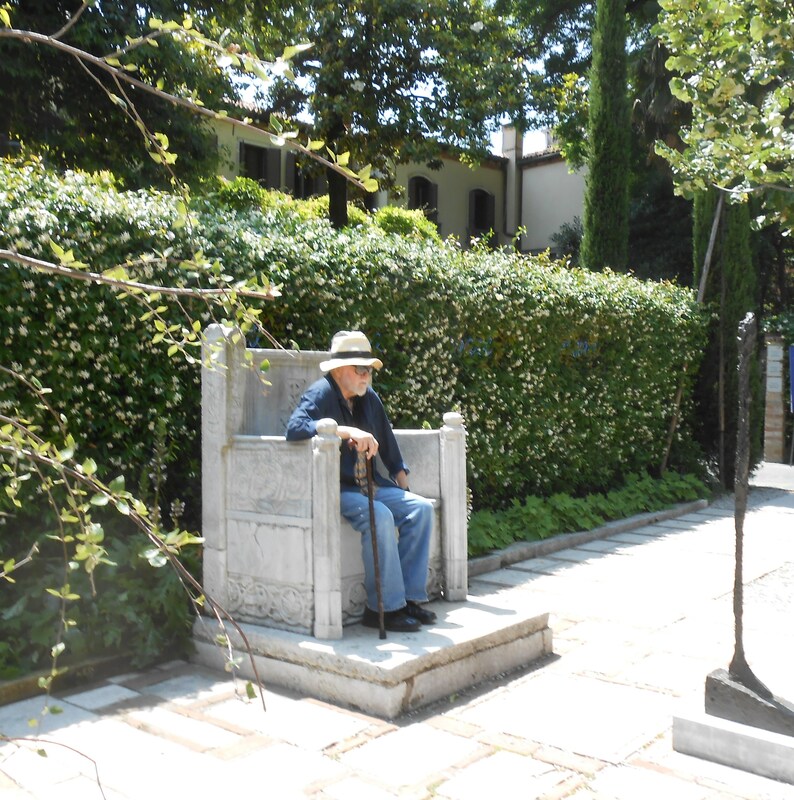 And according to Donna Leon, an American writer who has lived in Venice for over thirty years, the Venetians themselves (as well as the characters in her books) feel awed by the magnificence of this city. Through almost two thousand years, numerous well-known historical figures have stamped their names in the pages of Venetian chronicles. Roaming around Venice is akin to looking into these annals of history. First stop: Piazza San Marco and the famous Basilica San Marco.The church is the focal point in the square, and people and pigeons meander around despite the rain. And no worries about the square flooding this trip; acqua alta (tidal flooding that sometimes covers the square), usually occurs in late fall to early spring. 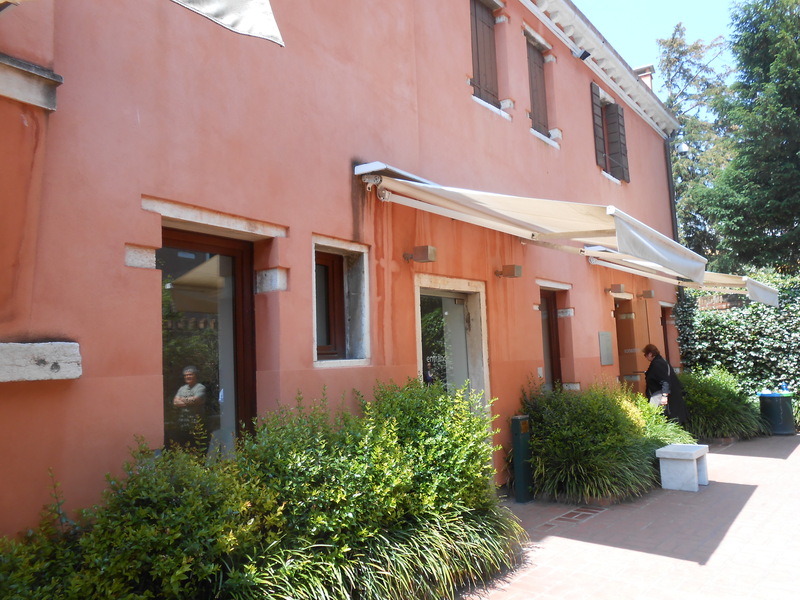 The original church, started in 828 and completed in 832, was built on the site of an earlier, smaller chapel dedicated to the first patron saint of Venice, St. Theodore. After that, destruction through fire (civil rebellion in 976), conquests (Napoleon, 1797), general aging and disrepair, and damage caused by the omnipresent pigeons required further rebuilding, remodeling, renovation, and restoration. Pigeons? Yes, pigeons cause damage to the mosaics and façade of the basilica, and despite various attempts to remove the pigeons, none have succeeded. 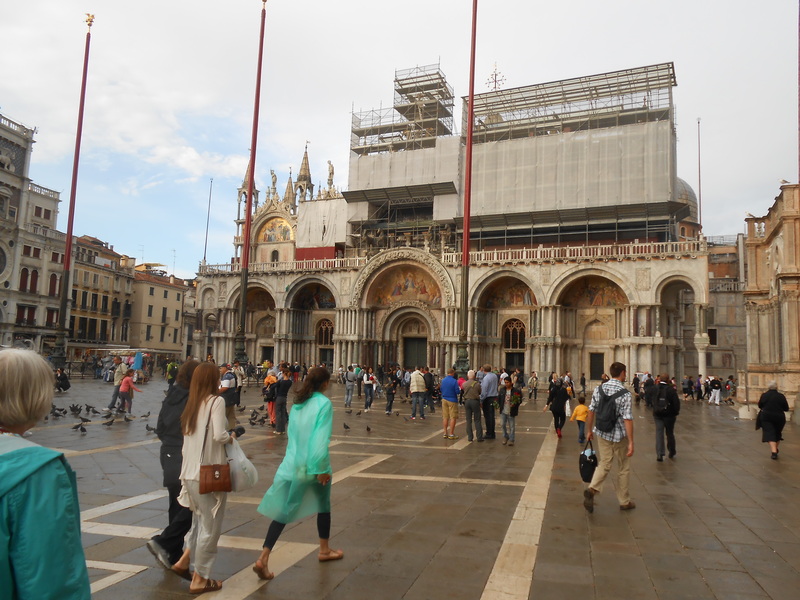 San Marco Square is named after St. Mark, follower of Jesus and the writer of the Gospel of Mark. The story goes that in 828, two rather devious Venetian merchants spirited away the bones of St. Mark from Islamic Alexandria, Egypt. They then transported these sacred relics to Venice in a barrel of pork thereby avoiding detection by non-pork-eating Muslim government inspectors. Having these religious relics in Venice cemented ties to the Christian church in Rome (as opposed to the Byzantine branch in Constantinople) and guaranteed that many visitors would come to Venice to offer homage and prayers. Scaffolding hides part of the basilica façade on my visit, but just beneath the scaffolding and just above the center arch and door, replicas of the four famous gilded bronze horses confiscated from the Hippodrome in Constantinople (formerly Byzantium, now Istanbul) after the conquest and looting by the Venetians during the Fourth Crusade (1204). Four Horses at Basilica San Marco taken as war plunder from Constantinople by the Venetians at the end of the Fourth Crusade. Wikipedia Commons photo. Religious crusaders, seeking to remove Muslims from the Holy Land in the Fourth Crusade, detoured to Constantinople because of a deal they made with the Venetians: attack Constantinople in trade for warships built in Venice. 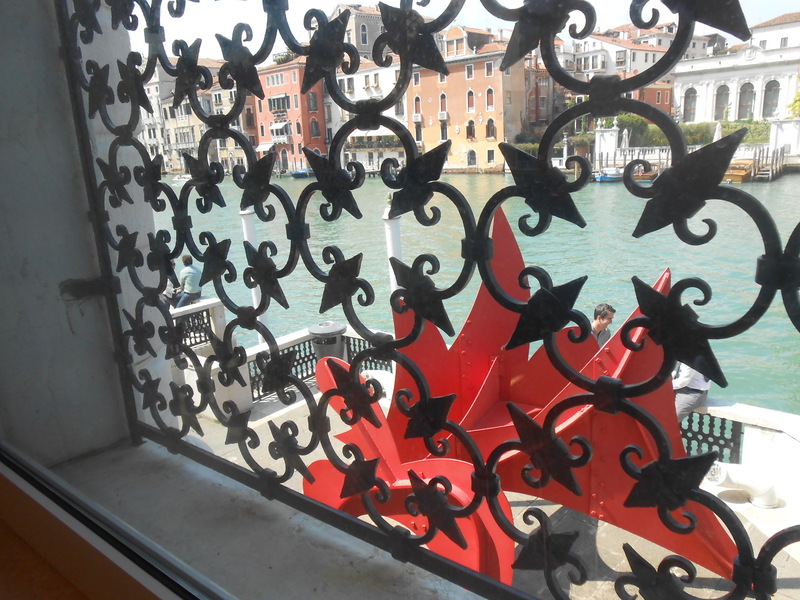 The Venetian motives were not exactly pure. They reaped economic fortune by supplying the warships to the crusaders, then as Constantinople fell, the Venetians, conveniently standing by, stepped in to take control. 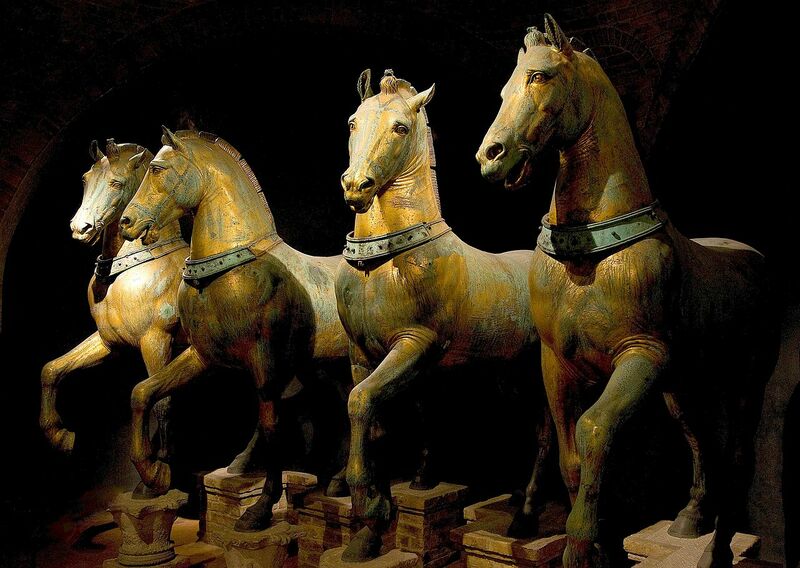 The motto, “to the victor belongs the spoils,” guided their behavior, and great Byzantine treasures, including these bronze horses, ended up in Venice. Valuable trading rights came to the Venetians as well. Venice became known as the “Queen of the Adriatic” and continued to prosper despite a round of the Black Death (1348-1349) that halved the population of the city. Jealousy and greed reign supreme, and Venice’s uncontested glory around the Mediterranean drew the ire of other world leaders. In 1508, Pope Julius II of the Holy Roman Catholic Church and Maximillian, the Roman Emperor, set aside their own differences to take on this growing menace in Venice. King Louis XII of France and Ferdinand II of Aragon, also mightily disturbed by the boldness of the Venetians and their trade monopoly in the Mediterranean, joined forces against Venice in the League of Cambria. Together these leaders and their armies destroyed Venice’s economic grip on the region. The Ottoman Turks, an even greater threat, moved into the vacuum (1522) left by the League of Cambria and finished what remained of the Venetians and their centuries of glory. Another round of the Black Death plague further weakened Venice (1575), and it never regained its controlling power in the Adriatic and Mediterranean. The French, led by Napoleon, still interested in Italian territory, came back in 1797 and lay siege to the Venice. After taking control of the city, Napoleon promptly sent those four bronze horses to Paris as his victory spoils. In 1798, Napoleon traded off his interest in Venice to the Austrians (1798) in the Treaty of Campoformio, although he returned again in 1804. The Austrians again occupied Venice in 1814 under the Treaty of Fontainebleau. After the fall of Napoleon in 1814, the Austrians again occupied Venice under the Treaty of Fontainebleau. The Austrians arranged for the return of the four horses from France, and they now reside inside the basilica. Freed from Austrian rule in 1866, Venice became part of the new united Italy under Vittorio Emanuele. Now in 2014, I try to imagine the pomp and circumstance what might have taken place in Piazza San Marco in earlier times. Fortunately, Medieval and Renaissance artists give us some idea of the glorious events that took place here. In this next public domain piece of art, Gentile Bellini (1429-1507) portrays the religious “Processione della Vera Croce a Piazza San Marco a Venezie (1496). Imagine the excitement, the noise, the splendor, the magnificence of so many clerics and officials gathered in the square. Bellini’s masterpiece is on display at the Gallerie dell’Accademia in Venice. 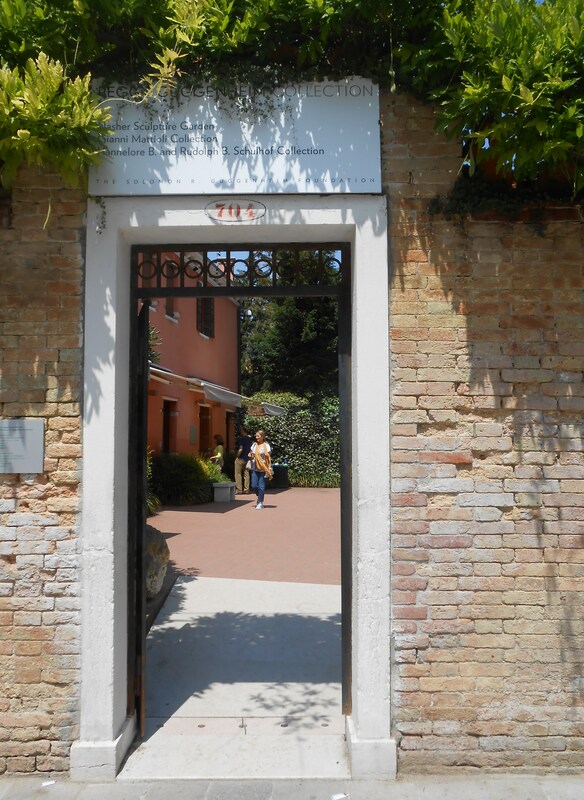 Reach out and touch 2000 years of history in Venice. This vibrant city will meet every expectation you have for beauty and excitement. 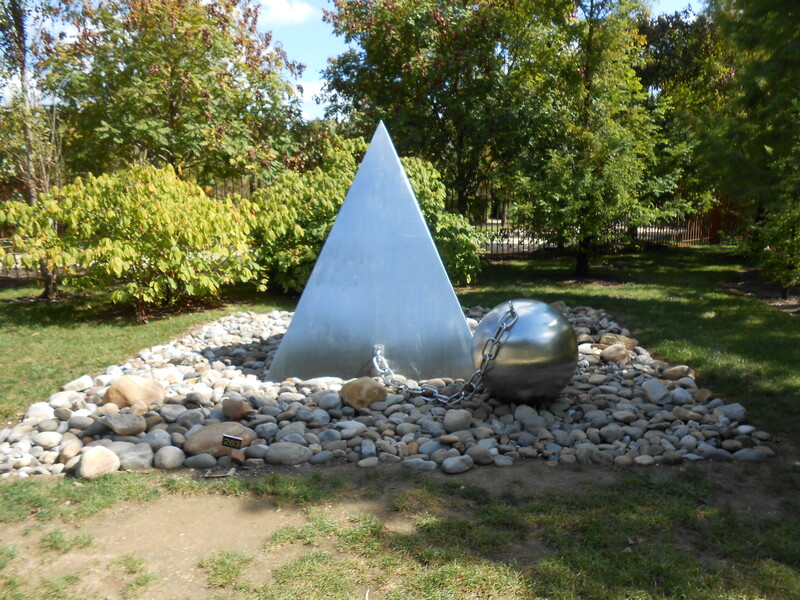 This photo is from one of my favorite places: Grounds for Sculpture near Trenton, NJ. It is a photographer’s heaven. So much to see and capture on camera.